UCITS offer investment managers a unique opportunity to significantly expand their distribution. UCITS are entitled to passport throughout the EU and have been approved for distribution in over eighty five countries. UCITS offer investors a product which operates within a well-defined regulatory framework where significant checks and balances exist. Given the appetite of investors for such well-regulated products and the distribution opportunities which UCITS offer to investment managers, UCITS represent over 60% of the overall investment fund market in Europe. Ireland is a leading domicile and administration centre for both UCITS products and alternative investment products. Assets under administration are €3.7 trillion. Irish domiciled funds amount to €1.8 trillion. Over 75% of all Irish domiciled funds are UCITS. In excess of 40% of global hedge funds are administered in Ireland. Ireland’s history of providing administration services to alternative investment products has led to significant expertise in administering complex financial instruments and strategies. 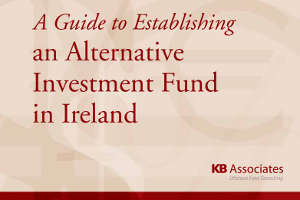 Ireland is the leading domicile for alternative UCITS. Assets in alternative UCITS have grown by more than 30% per annum since 2008. The Central Bank of Ireland provides a pragmatic and efficient regulatory approval process. The timeframe for gaining UCITS approval generally ranges from ten to twelve weeks. UCITS may use derivatives as part of a fund’s investment strategy as well as for hedging purposes. UCITS must provide twice monthly liquidity to investors. The liquidity of assets held in UCITS must not compromise a fund’s ability to do so. Alternatively, the entity establishing a Unit Trust may choose to utilise a proprietary management company. Alternatively, the entity establishing a CCF may utilise a proprietary management company. Alternatively, the entity establishing an ICAV may utilise a proprietary management company. A self-managed ICAV avails of the same regulatory advantages as an ICAV with a management company. UCITS must appoint an administrator incorporated in Ireland and authorised to provide administration services by the Central Bank. The choice of administrator is a critical decision since it is the administrator that interacts with investors. There are circa forty administration companies operating in Ireland. An institution authorised by a national competent authority under the UCITS Directive. There are circa eighteen specialist depositaries operating in Ireland. An investment manager must be regulated in its home country, which must be a country recognised by the Central Bank of Ireland as having equivalent regulatory oversight. There are twelve firms with dedicated investment funds practices in Ireland. If a fund wishes to be listed on the Irish Stock Exchange, a listing agent is required. Many of the legal advisors offer listing agent services as do a number of stockbroking firms. UCITS need to appoint an auditor. The ‘big four’ and a number of other firms provide audit services to funds. UCITS may appoint a tax advisor to advise on disclosures relating to taxation in the prospectus, on accessing double taxation treaties and general tax compliance. The appointment of a tax advisor is particularly important when establishing a CCF. There is a regulatory requirement to appoint two Irish resident directors. Best practice is to appoint directors who are independent of each other. The directors of a fund (both Irish resident and non-Irish resident) are subject to the approval of the Central Bank of Ireland. For a self-managed structure or where a proprietary management company exists, UCITS may require the services of a consultancy firm to advise on the eligibility of investment strategies and to prepare a business plan (governance) and risk management document. The consultant may project manage the UCITS set-up which may include advising on the appointment of a suitable administrator, depositary and other service providers. On an ongoing basis, the consultant may provide individuals to perform the six managerial functions set out in the business plan/governance document and to provide operational and compliance support. UCITS may decide to appoint an external management company such as that of KB Associates. This transfers risk and the capital requirement to an external entity. Reliance is placed on the existing infrastructure in place at a management company in respect of the launch and operation of a fund. Reliance is also placed on the management company’s existing UCITS compliant business plan/governance regime. 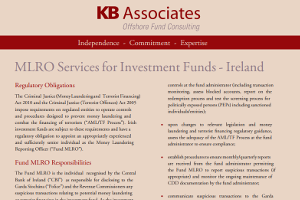 An Irish investment fund is required to appoint a Money Laundering Reporting Officer (“MLRO”). The MLRO is potentially subject to fines or imprisonment under the relevant legislation. There is no requirement that this position be filled by an Irish resident. Irish Company Law requires every company to have a company secretary. The Central Bank of Ireland must approve the investment manager. If the investment manager is not an Irish entity, it is not itself subject to authorisation or supervision by the Central Bank of Ireland but the Central Bank of Ireland must satisfy itself that the entity is appropriately regulated in its home state which must be a country recognised by the Central Bank of Ireland as having equivalent regulatory oversight. There is no Central Bank of Ireland imposed minimum capital requirement for a UCITS investment manager. Where a management company is appointed, it is the management company that is required to comply with the UCITS business plan (governance) and capital requirements. Where a UCITS is self-managed, the UCITS entity itself is required to prepare a business plan and comply with the UCITS governance requirements. The business plan sets out how the UCITS will perform the above six functions, who will perform them and the lines of reporting that will be set up to achieve this. The performance of the operational and risk management functions must be segregated from the performance of the investment management function. Additionally, UCITS are required to put in place an organisational effectiveness role which is segregated from the performance of all managerial functions and must be performed by an independent director. The role includes reviewing board composition, reviewing organisational structure and ensuring that adequate resources are available to carry out all managerial functions. The directors of UCITS (or a management company) may carry out the functions specified in the business plan or delegate these to named individuals/designated persons. The individuals must be approved by the Central Bank of Ireland to undertake such tasks. * These policies and procedures must be explicitly referred to in the business plan. If a UCITS intends to use derivatives, it must prepare an RMP document for submission to the Central Bank of Ireland. An RMP details the staff, procedures and systems utilised by the investment manager to manage the risks associated with the use of derivatives. It is necessary to complete such a RMP even where derivatives are utilised exclusively for hedging purposes. UCITS must monitor and measure global exposure at least daily. Global exposure is the incremental risk generated by the use of Financial Derivative Instruments (“FDIs”). UCITS may elect to use either the commitment approach for measuring global exposure and leverage, or may use an advanced risk management technique (e.g. Value at Risk (“VaR”)). The commitment approach requires each FDI position to be converted into the market value of an equivalent position in the underlying asset of that derivative. The calculation of global exposure is always presented as an absolute positive number and does not allow for the calculation of negative commitments. UCITS using the commitment approach must ensure that the global exposure from the use of FDIs does not exceed total NAV. When measuring global exposure using VaR, UCITS may use Absolute VaR or Relative VaR. Absolute VaR is the VaR of UCITS as a percentage of the NAV. Absolute VaR must not exceed 20% of the NAV. Relative VaR is the VaR of UCITS divided by the VaR of a UCITS eligible benchmark or reference portfolio. Relative VaR must not exceed two. The VaR model may use a different confidence level and/or holding period, provided the confidence interval is not below 95% and the holding period does not exceed twenty days. In such instances the VaR limit must be adjusted accordingly. UCITS must ensure that the prospectus, KIID and annual report include an up-to-date remuneration policy and that remuneration details of professional staff are included in annual reports. 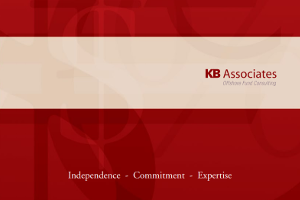 KB Associates is an independent provider of management company and consulting services. 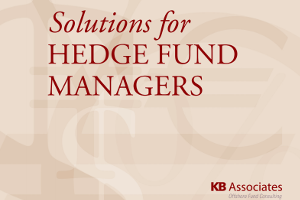 KB Associates is dedicated exclusively to meeting the needs of managers promoting investment funds. KB Associates is independent of the various service providers to UCITS (administrators, depositaries, auditors, legal advisors etc). As it offers services solely to funds, KB Associates is well positioned to monitor the performance of service providers as required by the UCITS management directive. 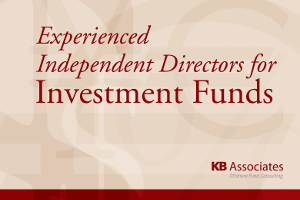 This ensures that KB Associates avoids potentially significant conflicts of interest. KB Associates is entirely independent of all potential service providers and professional advisors. KB Associates has significant experience in service provider selection. KB Associates maintains a database detailing the product offering of each service provider based in Ireland. KB Associates also oversees service providers on behalf of our clients. This allows us to monitor the actual quality of service against the stated capabilities. KB Associates can advise on the selection of the auditor, legal advisor and listing agent. 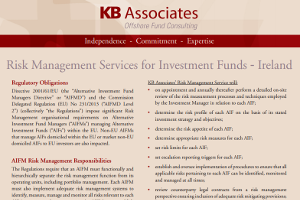 KB Associates can establish operating procedures between the various service providers to UCITS, principally between the investment manager, administrator and depositary. KB Associates can also establish service level standards with the service providers and set in place reporting procedures to monitor actual performance against agreed standards. Where the business plan of UCITS is prepared by the legal advisor to a fund, KB Associates will review the business plan. Alternatively KB Associates can prepare the business plan. 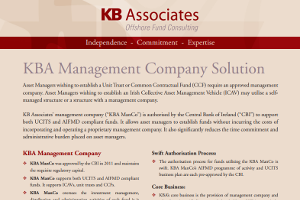 KB Associates has a team of consultants with expertise in risk, investment management, compliance, finance and operations, and is well placed to prepare a pragmatic business plan meeting the Central Bank of Ireland’s requirements without placing unnecessary burden on a fund or its investment manager. Where the KB Associates’ management company is appointed, the business plan used will be the existing KB Associates’ management company business plan. KB Associates advises on the eligibility of specific investment strategies under the UCITS investment restrictions. KB Associates has particular experience in the preparation of RMP documents. KB Associates can review all legal documents (prospectus, KIID, supplements, depositary agreement, administration agreement and investment management agreement) from an operational perspective. The management company is authorised by the Central Bank to support both UCITS and AIFMD compliant funds. It allows asset managers to establish funds without incurring the costs of incorporating and operating a proprietary management company. It also significantly reduces the time commitment and administrative burden placed on asset managers. The management company assumes legal responsibility for overseeing the investment management, distribution and fund administration activities performed by its appointed agents. The management company’s directors have expertise in investment management, risk management, depositary responsibilities and fund operations. 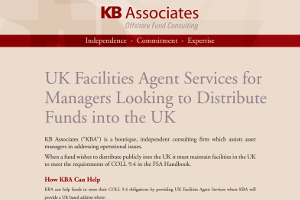 KB Associates currently supports a number of UCITS by providing consultants to undertake the management functions which the business plan requires a fund company to fulfill. The consultants to whom the board of directors delegates performance of the business plan functions must be identified in the business plan and approved by the Central Bank of Ireland. KB Associates’ consultants have been approved to perform this role. The UCITS business plan identifies a number of specific functions defined by the regulations, which KB Associates undertakes for its clients. KB Associates provides operational and compliance support to its clients beyond the functions specified in the business plan. This may entail a range of activities including KB Associates completing on-site reviews of the depositary and administrator, identifying opportunities for UCITS to reclaim VAT, reviewing compliance with the Irish Funds corporate governance requirements and acting as fund system administrator for Central Bank of Ireland reporting. 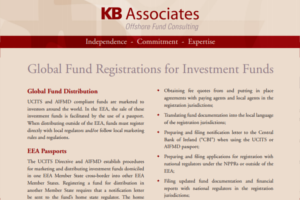 Where appointed to provide services to UCITS, KB Associates acts as a fund’s and the investment manager’s operations and compliance partner in Ireland. 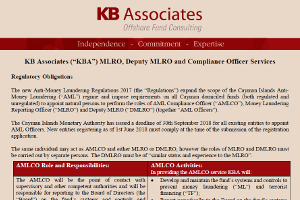 The MLRO is responsible for overseeing the adequacy of the work undertaken by the administrator in relation to compliance with anti-money laundering legislation. 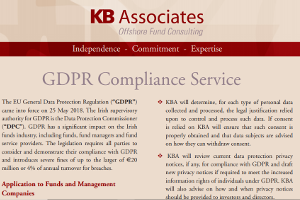 At KB Associates, this function is performed by professionally qualified consultants who are members of the Association of Compliance Officers in Ireland. Irish Company Law requires every company to have a company secretary. 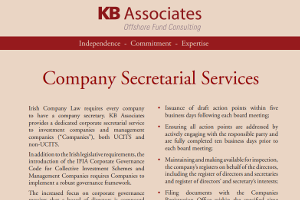 KB Associates provides a dedicated company secretarial service to UCITS investment companies and UCITS management companies.